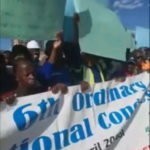 Hundreds of workers gathered in front of the Ministry of Works and Transport after marching from the centre of Windhoek to hand over a petition in which they demand that tenders worth billions of dollars should not be given to foreign companies. 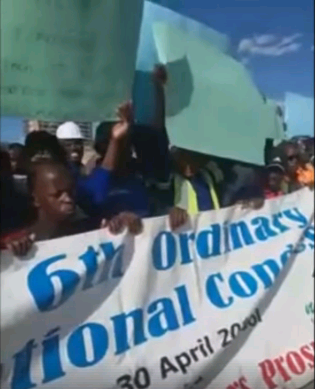 The workers went over to mass action under the auspices of the federation labour unions and are demanding to see the Minister of Works and Transport, John Mutorwa. The workers also want to hand the petition to the Minister of Finance and the CEO of the Roads Authority. The workers claim when Chinese companies especially are contracted to develop capital projects, they bring in their own labour force and leave Namibians jobless.